I make a lot of banana bread. Not just because I love it, but because I usually overestimate how many bananas we will go through, and almost always buy too many. I like my bananas medium rare: just yellow, with maybe a tinge of green. Once they start to get too well done, I move them off the counter to make room for the next bunch of bananas (and resolve to eat those on time – really). Meanwhile, the previous batch continues to happily ripen away in another part of the kitchen, getting softer and darker by the day. Once they are black and completely well done, they either become banana bread right away or get moved to the freezer to join other blackened bananas awaiting banana bread fate. Now, on to the Nutella, that creamy chocolate hazelnut spread native to Europe but now a staple in most American grocery stores. 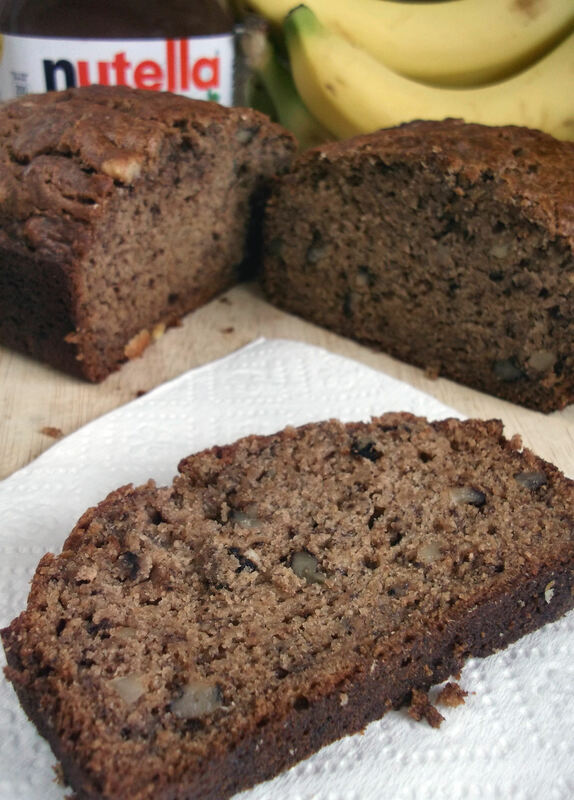 A friend once got me to try Nutella on banana bread, and it was really great. Let’s be honest, Nutella is great on just about everything. Even a spoon. But unless the bread and/or the Nutella are warm, spreading it without tearing the bread can be tricky. So one day I thought I’d just add the Nutella right into the batter (based on an old Betty Crocker recipe) so it’s already there, baked into every slice. 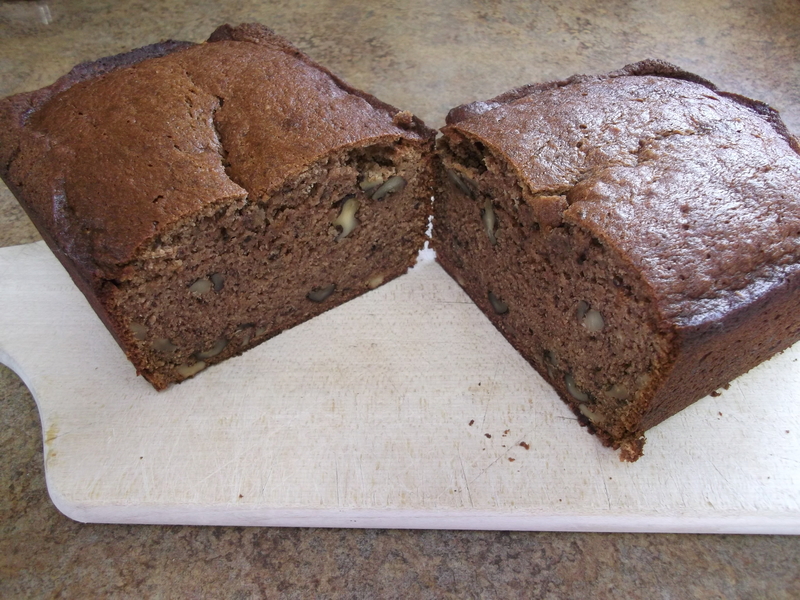 It turned out super moist and delicious, and I have been making it that way ever since. Preheat oven to 350 F and spray an 8” or 9” loaf pan with cooking spray. Mix butter and sugar in a large bowl. 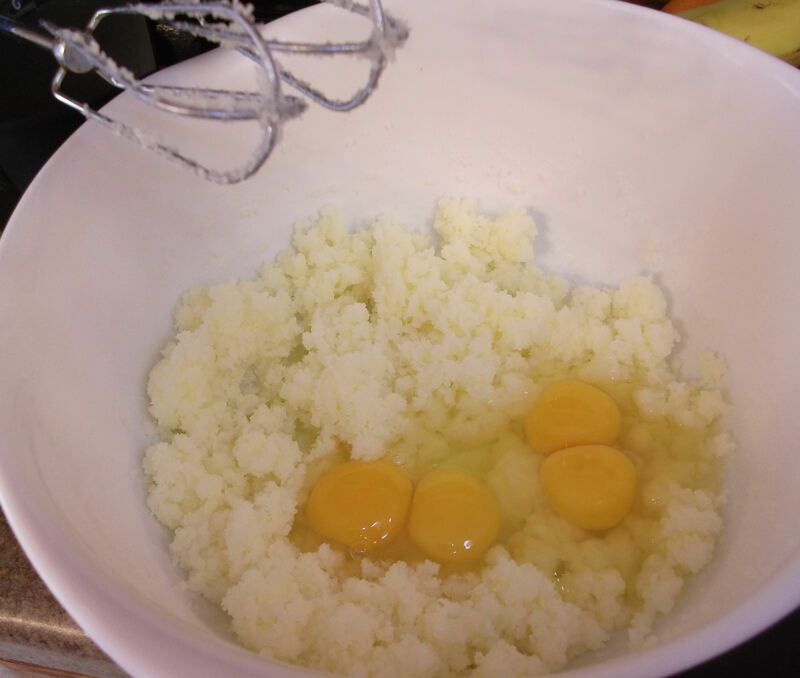 Mix in eggs until blended. Add bananas, water (if using), Nutella, and beat for 30 seconds. 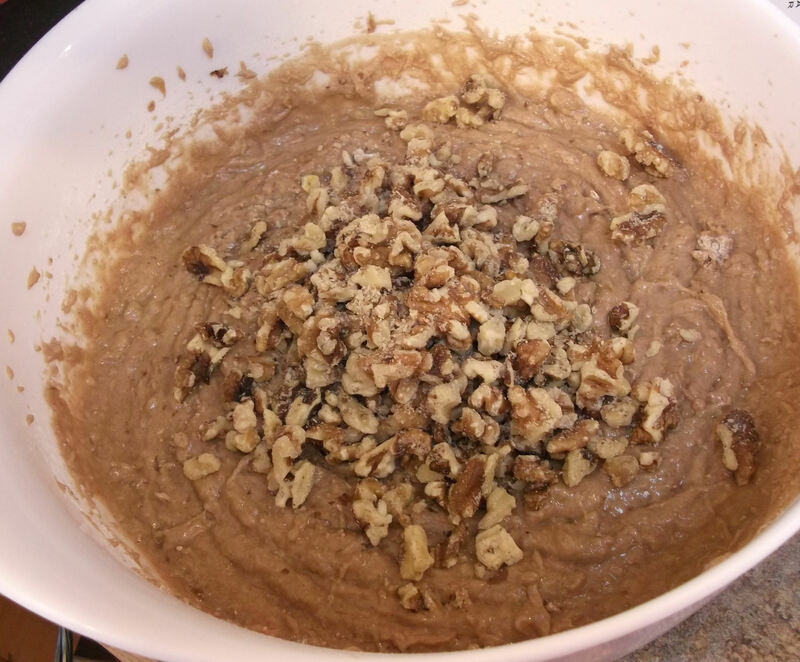 Add remaining dry ingredients — except the nuts ‑‑ and stir just until moistened. Then stir in the nuts. 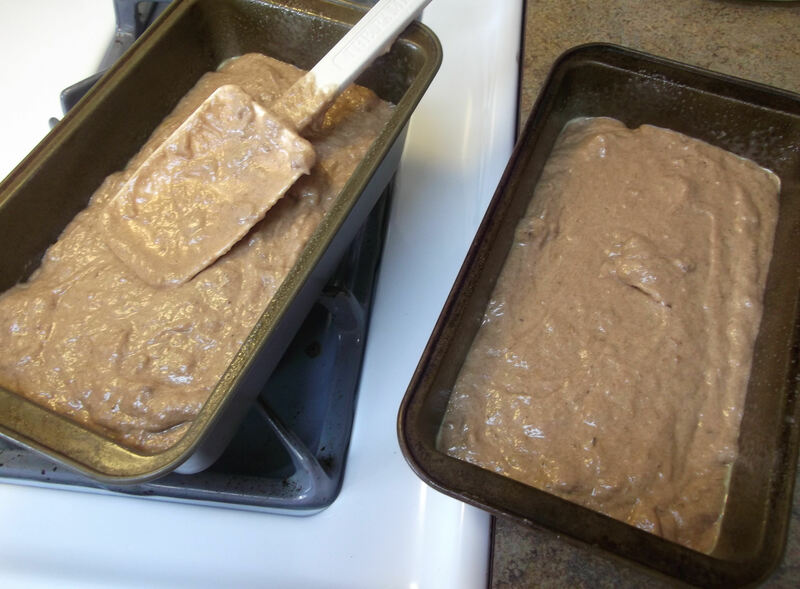 Pour batter into the greased loaf pan and bake until a toothpick inserted in the middle comes out clean: 75 minutes (1¼ hours) for an 8” loaf; 55-60 minutes for a 9” loaf. Cool bread in the pan for 5 minutes, then loosen from pan and remove loaf to cool completely. For muffins, pour batter into greased or lined muffin tins and fill each cup about 3/4 full. Bake for 25 to 30 minutes, until a toothpick inserted in the middle comes out clean. Let’s start by combining all the dry ingredients (except the nuts) in a medium bowl. Yes, I tried to make a smiley face in the flour. It didn’t turn out so well, but it’s the thought that counts. Whisk those together to blend well and set aside. On to the bananas. I find the blacker they are, the better. 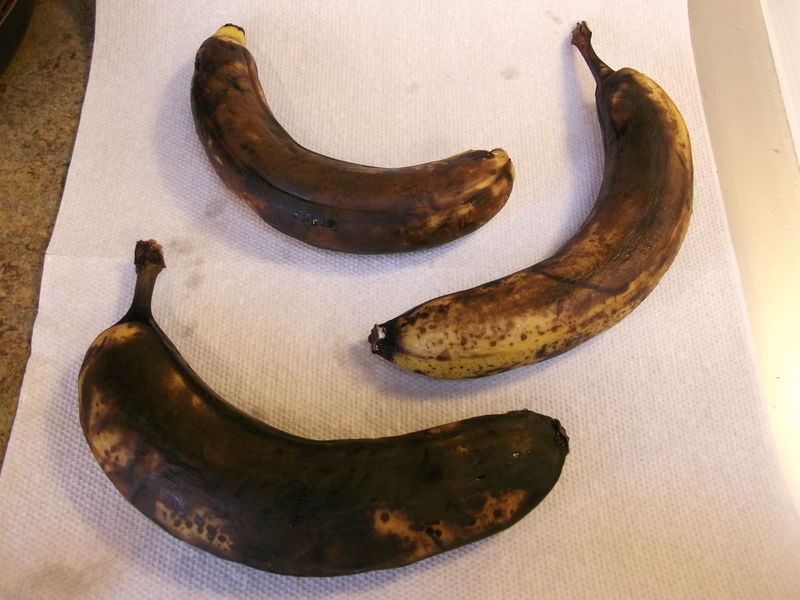 I usually freeze my overripe bananas: sometimes I freeze them whole, peeling them after they thaw, and other times I peel them first and freeze them in a plastic freezer bag. Either method works, as long as the bananas are completely thawed before using. 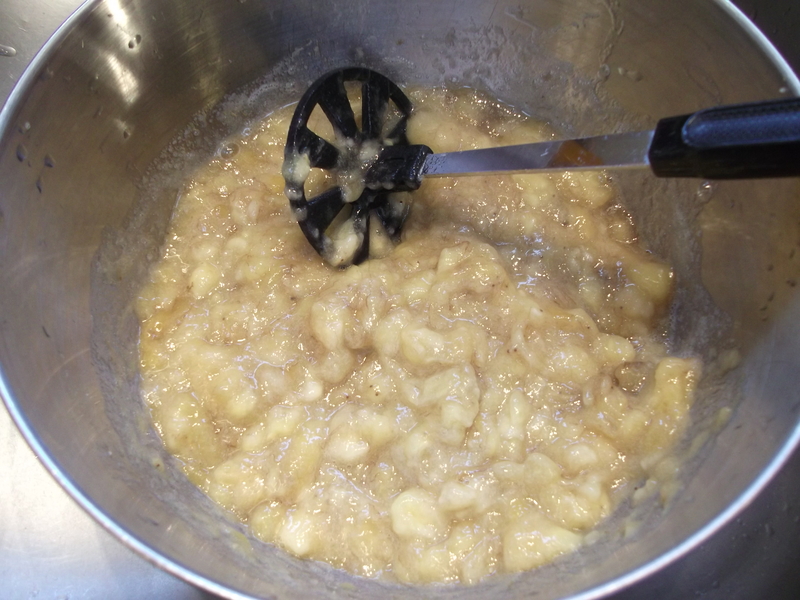 In a small bowl, mash the bananas with a potato masher. The recipe calls for a little water to be added in this step, but I only add the water if I am using fresh (not frozen) bananas. The thawed frozen ones seem pretty watery on their own, so I don’t add the water to those. Set the bananas aside. Now let’s crush the walnuts. 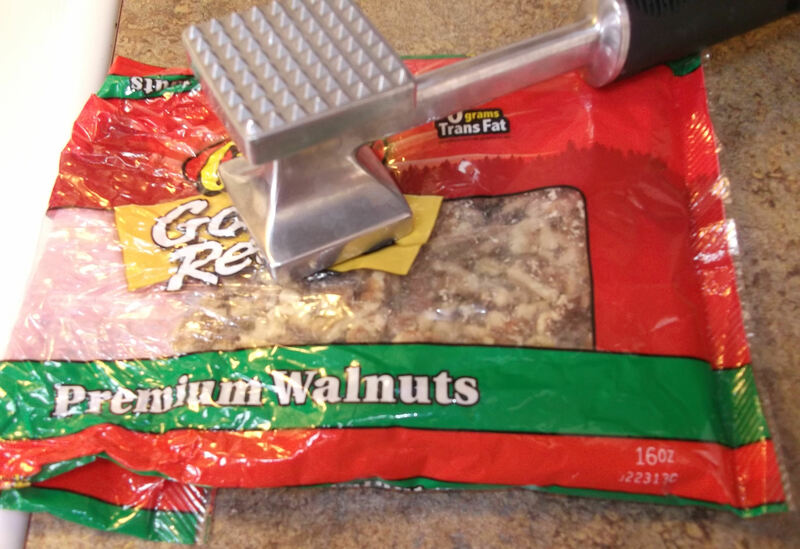 I use a meat mallet and crush them right in the bag. Use the smooth side of the mallet, or you’ll poke a bunch of holes in the bag, and that doesn’t help anything. 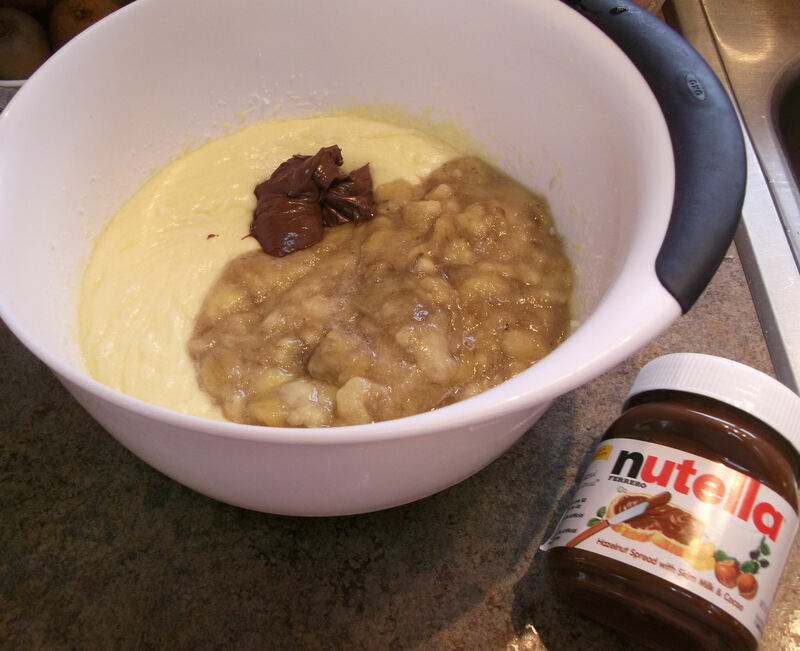 Add the mashed bananas and Nutella to the butter mixture. Beat on high for 30 seconds. The batter will turn much darker: that’s just the Nutella infusing chocolatey goodness into every molecule of the batter. 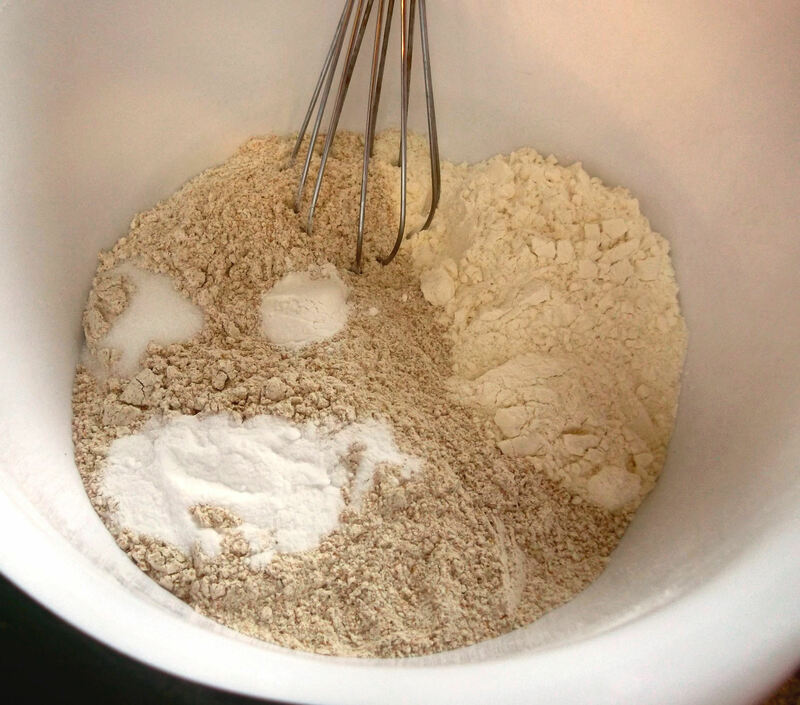 Add the flour mixture and stir with a wooden spoon just until moistened. I have to confess that sometimes I will use the electric mixer on the lowest speed for this step. However you choose to do it, just do not overmix the batter. Now, measure out about a cup of crushed nuts and pour them in. If you love nuts, use a little more. Gently stir in the nuts, just enough to evenly distribute them. Again, do not overmix the batter. 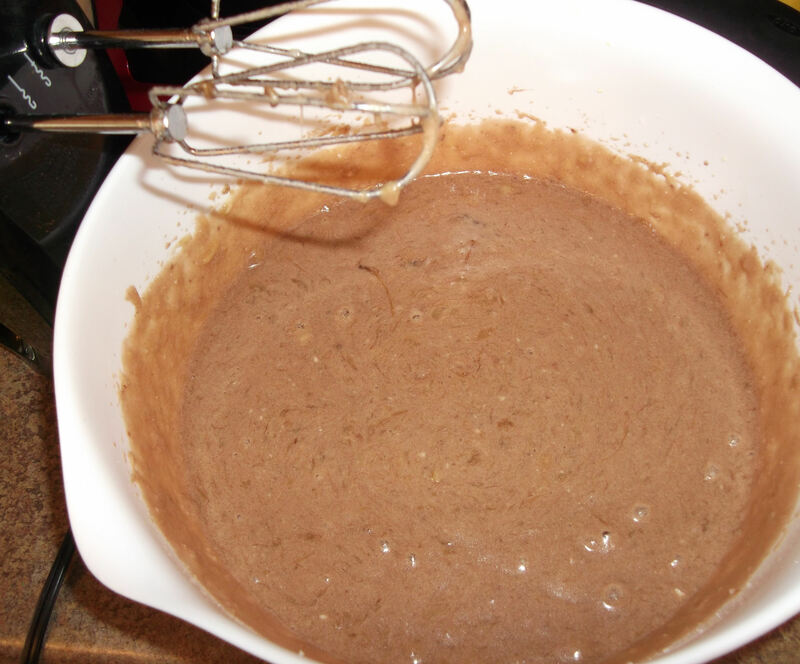 Pour the batter into the greased loaf pan (or pans, plural, if making a double batch). Spread the batter evenly in the pan. Bake at 350 F until a toothpick inserted in the middle comes out clean: for an 8” loaf, this should be about 75 minutes (1¼ hours); for a 9” loaf, this should be about 55-60 minutes. Cool bread in the pan for 5 minutes, then loosen from pan and remove to cool completely. When cooled, slice it up and enjoy! 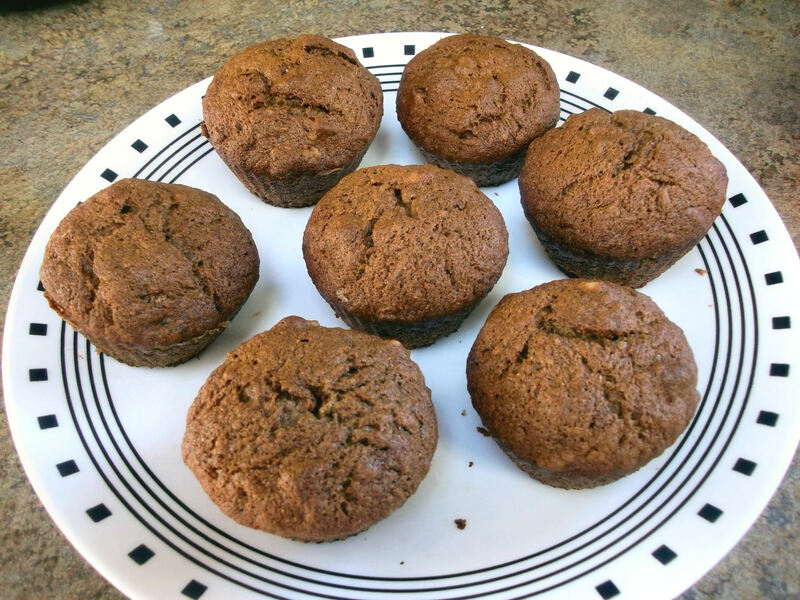 To make these as muffins, fill each muffin cup about 3/4 full and bake 25-30 minutes at 350 F.
Note: this banana bread freezes very well. Wrap a completely cooled loaf — sliced or unsliced — tightly in plastic wrap and store in a freezer bag. I first discovered Nutella on crepes in Paris. I was there for six weeks and had one nearly every day. Can’t wait to try it on banana bread. It sounds delicious. I’ve got some bananas on the counter getting ripe enough to try this. It sounds so good.